OMAF 2013 Summary for Cereals | Chatham-Kent Agriculture Development | We Grow For the World! Fall 2012 Planting: Ideal planting conditions resulted in 950,000 acres seeded with the majority planted in September; setting the stage for high yield potential. Hard red (HRW) acreage slid to 11% of the crop, from 15% in 2011, as price premiums eroded due to ongoing protein issues. Soft white acreage slipped slightly to 6%, from 7% the year previous, leaving soft red to make up the lion’s share of the crop at 83%. Winter barley continues a slow resurgence, particularly on dairy farms, where the barley can be fed, the straw is needed badly, and double crop soybeans can work due to earlier harvest dates. Spring Wheat 85,000 acres (-10%), Oat 65,000 acres (flat), Barley 115,000 acres (-8%) and Mixed Grain 100,000 acres (+10%). Spring arrived relatively late, with most areas not beginning growth until April. Winter survival was excellent, with almost record low levels (<1%) winter kill; predicated by the early fall planting dates. April brought more than twice the normal amount of rainfall, with all the expected impacts. Significant nitrogen (N) losses occurred from early applications in poorly drained fields. Yellow wheat and tile run wheat was common and N applications were delayed into mid-May. Many growers planning on split N applications ended up doing single applications, just due to timing. The result was a reduced yield potential. Winter annual or perennial weed control became “revenge spraying,” as by the time growers could get into the field these weeds had already bolted and the damage was done. This again drove home the benefits of fall weed control. Spring cereal seeding dates were also delayed. May weather improved considerably, allowing for rapid spring cereal seeding progress, along with N, herbicide, and fungicide applications on winter crops. Dry weather, excessive tillage and shallow planting depths resulted in some very spotty spring cereal stands in some regions. Winter barley never recovered in many fields, either from “wet feet” in saturated soils too long or from cold injury. Spring barley went through a very “yellow” stage, due to cold temperatures. Leaf burn from herbicide/fungicide or N applications was severe, a result of extremely thin cuticles from extended cool cloudy conditions prior to application. Fortunately, this rarely has a negative impact on yield. Sulphur (S) deficiency was more evident again this year, similar to 2011, giving some indication that sulphur applications are likely more beneficial on wet soil when S release from organic matter is delayed. Manganese (Mn) deficiency was common on typically deficient soils. Severe frost on several days from May 24th to May 27th resulted in severe leaf injury and some pollen sterilization across parts of southwestern Ontario. Had this frost hit a few days later, the impact would had been severe. Earliest fields on sand soils in the Thamesville to Rodney area were most affected, with a few fields damaged so severely they needed to be replanted. Across a wide area, earliest wheat fields just beginning to head had some damage, although not severe. Fusarium: A return to frequent showers in early June caused fusarium prediction maps to go from green to red virtually overnight. The balance of the year became all about fusarium, toxins and grade discounts. There were a few areas that escaped this problem such as Bruce, Grey and Simcoe counties where dry weather persisted. In this region, many growers had record yields and amazing quality. Unfortunately, in much of the wheat area, fusarium damaged kernel counts were reported as high as 20%. Toxin levels were higher than expected, based on fusarium-damaged kernels (FDK) counts. Grade discounts went as high as $2/bu and turned an awesome crop into a huge disappointment. 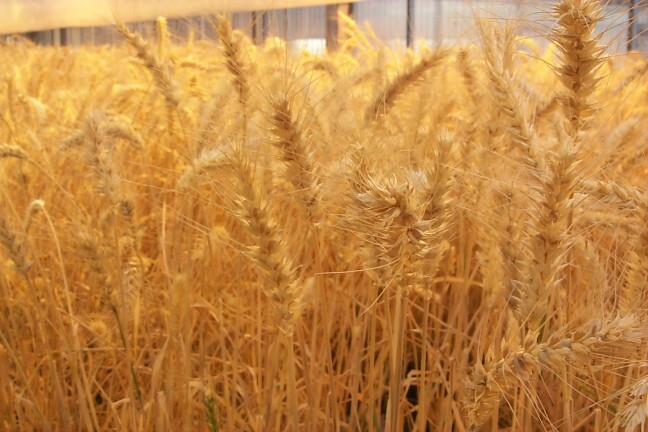 Fusarium fungicides were a must, giving record levels of control, but in many cases merely taking “sample” wheat and turning it into “feed” wheat. Some elevators applied sliding scale discounts however, making those fungicide applications return good profits even when the wheat was still feed. Final yields ended up slightly below trendline: winter wheat 80.7 bu/ac (5.4 t/ha), spring wheat 50.6 bu/ac (3.4 t/ha), and spring cereals (barley, oat, mixed grain) 66 bu/ac (3.0 t/ha). Protein levels in HRW and HRS were back to normal levels and quite acceptable on average, with a few notable exceptions. Strong demand for straw continues, with prices generally 3 to 5 cents/pound in the swath. Oat and barley acres as a cover crop or forage crop after wheat dropped somewhat compared to 2012 with good hay yields meaning less need for emergency forage. Red clover stands were excellent. Overall, the percentage of acres receiving a cover crop, from red clover to daikon radish and annual ryegrass, has increased dramatically over the past 2 years. Fall 2013 Planting: Fall seeding began about 2 weeks later than fall 2012. Early September remained ideal, and early wheat looks excellent. Rain returned the last week of September and continued right into November. The typical planting window of “Thanksgiving weekend” saw the bulk of the wheat planted, with frequent showers making soil conditions marginal in many fields. The edges of the province: south and west of London, and Bruce, Grey Simcoe, had less rainfall through most of October, with a much greater proportion of final wheat acres being planted in those regions. November brought excess moisture to all areas. In the end, a surprising 790,000 acres of wheat was planted, and winter barley acres bumped up slightly. The proportion of HRW acres slipped again, primarily due to little price incentive, with only 7.5% of plantings. SWW drifted slightly lower to 5%, leaving SRW to take an even larger share at 87.5%. As of this report (Nov 19), only the earliest or best drained wheat fields look good. With continued saturated soils, twitter and email are buzzing with red/brown/purple wheat comments and questions, and tile run wheat abounds. Despite the duress the crop is under, it is a long way until harvest, and wheat has an amazing ability to rebound and compensate. Management – Winter Cereals: Wet weather in 2012 impacted response to management inputs. The benefit from fusarium fungicides was significantly greater than normal. Sulphur response increased over 2012. Nitrogen response continues, with 120 lbs N/ac the standard rate, and many fields responding to rates up to 150 lbs N. Weather challenges are forcing many growers to split N applications, as insurance against heavy rainfall events, and in an effort to increase yield. Fall nitrogen applications bring no value. Leaf burn by herbicide, fungicide and N applications continues to be a concern. Management – Spring Cereals: Fusarium concerns once again plagued spring wheat production, and even with fusarium fungicides, growers were disappointed. Better answers are needed. Seeding early and into moisture is important to ensure uniform stands. Research is ongoing to find improved management techniques for cereal crops, to make them more competitive in Ontario cropping systems.